The trumpet plant, also called burgmansia or angel's trumpet is a beautiful variety of flower with many cultivars. Trumpet plants are relatively easy to propagate from seed and they can be planted directly into your garden. Seeds may be harvested from an existing trumpet plant if you already have one growing at home. Home-harvested seeds from hybrid plants may not produce trumpet plants that look exactly like the parent plant. Sterilize your seed-starting potting soil. Pour it into a colander lined with paper towels. Then pour boiling water over the soil. Allow it to return to room temperature. Fill a 6-inch container to within three-quarters of its rim with the (still wet) potting soil. Press three to four seeds into the surface of the soil so that only their top surface is visible. Give them as much growing room as possible. Cover them with roughly 1/4 inch of soil. Do not press it down. Moisten the top layer of the soil with water from a spray bottle. Place the container in a warm, indoor spot where it will receive indirect sunlight until the seeds germinate. Keep the soil moist (not wet) by spraying it with water whenever it begins to dry out. Transplant the trumpet plant seedlings into individual 2-inch containers filled with moistened, sterilized seed-starting potting soil when they have two true leaves (the ones that emerge after the first two seedling leaves). Carefully lift the plant out of the soil. To avoid damaging it, place a long thin implement underneath its roots and push it up as you hold one of its leaves. Then handle it carefully as you re-plant it at the same depth that it grew in the 6-inch container. Place the newly-transplanted seedlings in indirect sunlight. Water them whenever the top of the soil feels dry. Move them into direct sunlight after one week. Transplant them outdoors in spring. If you are unsure of the source of your trumpet seeds, or have had problems with disease in your garden, sterilize the seed first. Soak the seeds in water for 24 hours. Then carefully peel away the cork-like outer covering. Then soak the seed in a solution that is 1 part water, 10 parts bleach for 10 minutes. Allow freshly harvested or bleach-treated seed to dry for 24 hours before planting it. Germination may take two weeks or several months. If any seeds emerge with the cork-covering still attached, mist them with water daily until it comes off. If it does not, use tweezers to remove the cork-covering without damaging or pulling on the plant. 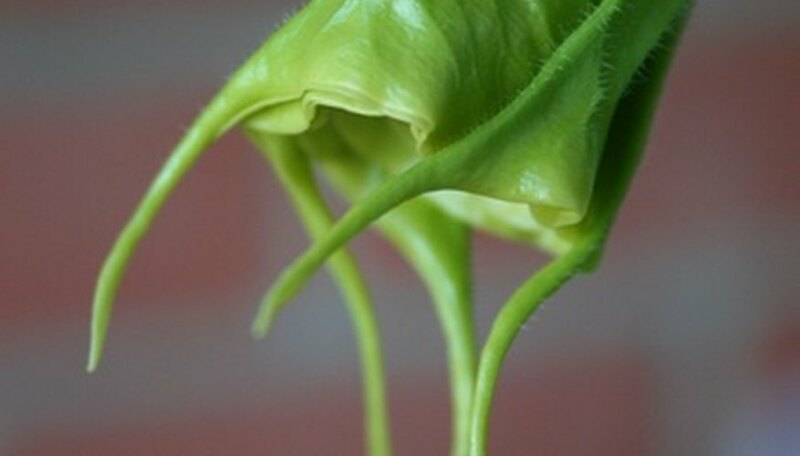 Certain species of trumpet plants have sterile seeds.